ASUS ROG Strix GTX 1070 OC Review & Benchmarks | Best Graphics Card for 1440p Gaming? What’s goin on guys Jerry Neutron here and I’m back with another video! 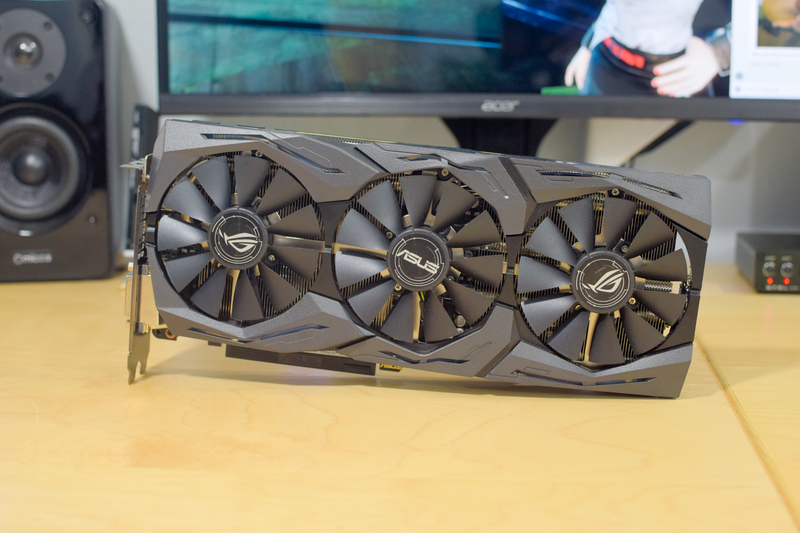 And today I’m excited because I get to show you guys something that I just got in for review from ASUS, this is the Strix GTX 1070! So for those of you not familiar with this card, it’s based on the new #NVIDIA Pascal architecture. It’s got 1920 CUDA cores, 8GB of GDDR5 Memory on a 256-bit bus, its factory overclocked to 1632MHz on the core with a boost clock of 1835MHz and that’s in gaming mode which is the mode this card runs in by default. Fun fact, my card was actually shipped in Gaming Mode and not OC mode, not sure if that means that’s no longer a thing for reviewers or if I’m just not important enough and they didn’t bother…we’ll never know! And lastly we’ve got a 8000 MHz effective memory clock. So taking a look at this thing, the first thing you’ll notice is the giant triple fan cooler on top. It’s apart of what ASUS calls their DirectCU III cooling technology and it features 3 90mm fans, dual heatsinks and direct-GPU contact heatpipes. And all of that is supposed to equate to an efficient and quiet cooling solution which we’ll talk about in a moment but let’s take a look at the rest of the card first. On the opposite side they’ve included a backplate which gives the card a pretty clean look. 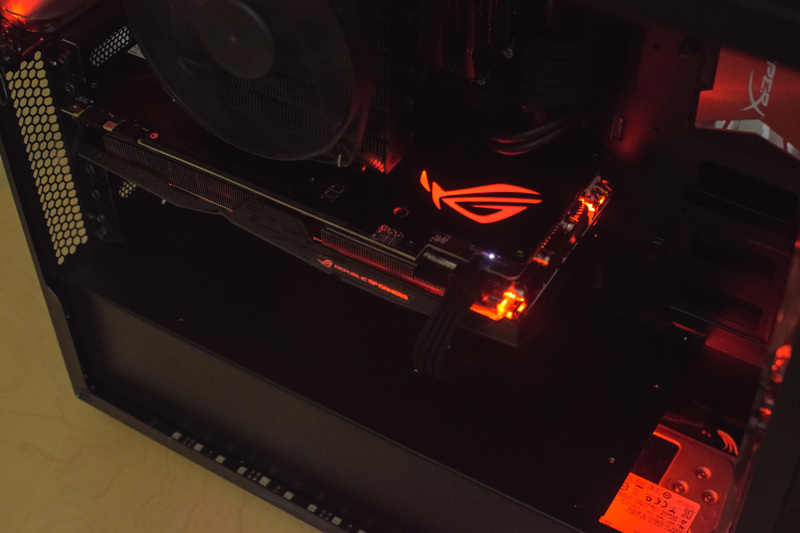 It’s got an ROG logo on it which is RGB backlit and there’s actually RGB lighting in several areas on the card. There’s small strips around the fans on the face of the card as well as on the Republic of Gamers font on the side of the shroud. Now RGB lighting isn’t necessarily a selling point for me but #ASUS has actually done it properly by giving us a color neutral card. It’s totally pointless to have RGB lighting if your card is red or yellow or orange so I gotta give props to them for doing it right here. As for connections, this card has a single 8-pin connector providing power to the card which is crazy to think about considering how fast it is, it wasn’t that long ago that we were seeing dual 8-pin connectors on the top end cards so I’m definitely liking where we’re headed from an efficiency standpoint. 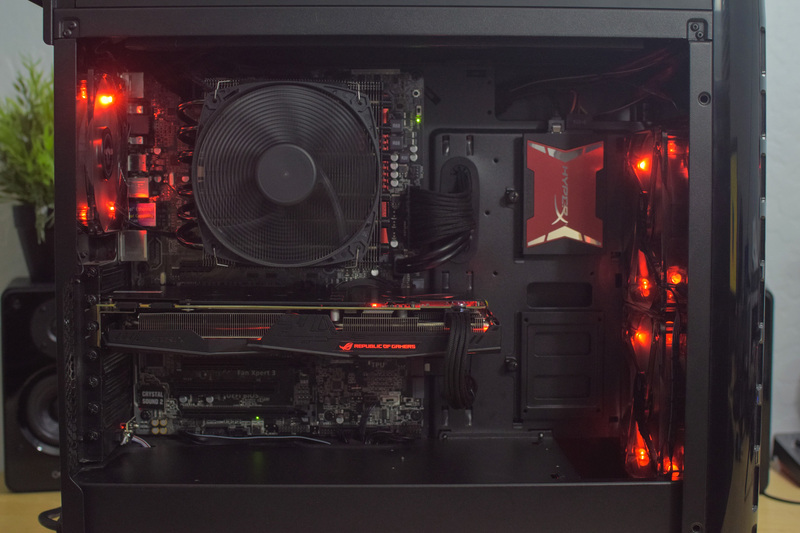 You’ve also got two 4-pin fan headers on board which will allow you to connect case fans to the card and they’ll ramp up or down based on the load of the GPU to give you supplemental cooling. I could see something like this being used in SLI setups where you could use additional airflow during gaming or benchmarking so I think it’s a nice touch. Moving on to the I/O side we’ve got two DisplayPort 1.4 connectors, DVI-D and two HDMI 2.0 ports. The extra HDMI port is for VR so if you want to connect your headset and a display to the card at the same time you can which is a likely scenario if you are gaming in the living room. So one will go to your TV and the other to your headset. Alright so fast forward a little bit, I’ve got the card installed and I’ve been using it for a couple weeks now, here are some things I’ve noticed while gaming. I’m seeing a max temp of about 68C which is a nice improvement over the Founders Edition. I’m also seeing a max boost clock of 1974MHz which finally levels out to around 1936MHz after 20 to 30 minutes. The good thing about this card is the fans don’t spin until the temp reaches 55C so when you’re just browsing the internet, watching YouTube and stuff the system is nice and quiet. In fact I’ll give you guys a little sample of what my system sounds like at idle and then under load. What you’re hearing at idle is my CPU cooler and case fans so just keep that in mind…and then under load with the GPU joining in. So as you can hear the card isn’t very loud under load, at least with the default fan profile so I can’t really complain from an acoustics standpoint. If you want to do any tweaking to the fan profile or even overclocking, ASUS provides their own software which is called GPU Tweak. In the software you can can switch between performance profiles like OC mode, Gaming mode and Silent Mode. You can monitor your GPU vitals, disable the 0dB fan mode to make your fans spin all the time and if you enable Professional Mode, you can even overclock your card. So here you can set your GPU boost clock which it looks like you’re limited to a +91 offset in manual mode but if you click on the user defined option it looks like you can set your own power curve past that. There’s also of course GPU voltage and memory clock adjustments, fan speed, where you can define your own fan curve as well as the other typical options that you’ll see if you’ve ever used software like Afterburner or Precision X. Remember when I said this card had RGB lighting? Well this is where you would customize the lighting options. Under light effects you can choose between static and breathing and color changing modes, you can select whatever color you want to display from the color wheel on the right. There’s even a music mode where the lights will react to the beat and a GPU temperature mode where the color of the lights will change depending on how hot the GPU gets. OR if you hate RGB lighting altogether, you can simply turn them off as well. Alright so with all of that said, let’s finally get into the benchmarks! So as you can see this is a pretty solid performing card, perfect for 2560x1440p 60Hz gaming. If you want to game at resolutions higher than that I’d recommend stepping up to a GTX 1080 or better but ultimately that choice will be up to you. Overclocking was just decent with this card as I wasn’t able to push the core very far, I hit a max overclock of 2038MHz which eventually leveled out to just over 2000. For the memory I had a lot more room to play with, that I pushed all the way to 8808MHz. It seemed like I could push the card further but I kept hitting the power limit and I think that was ultimately holding me back, that and the voltage being locked to 1.093v. That aside, there’s not really much to complain about in regards to this card. This is one of the more expensive 1070s however, right up there in price with the Amp Extreme card from Zotac, the Gaming X from MSI and the FTW edition from EVGA so if you’re trying to fit a 1070 into your budget you many want to consider one of the non-overclocked cards as they are closer to the $400 mark. If you don’t mind spending $450 bucks on a 1070 however, this card definitely needs to be on your list of considerations. So that’s about it guys, make sure you show this video some love if you enjoyed it! Don’t forget to subscribe if you haven’t already! Also, I started a 2nd channel, link is in the description below! Make sure you guys subscribe to that as well as I’ll be posting in-game benchmarks of any cards I get over on that channel! Anyway guys I’m outta here, til next time…see ya! DOOM: Vulkan vs OpenGL – Will Older AMD GPUs See Gains?